With a single smartphone app, you can now get a pretty accurate forecast of the weather anywhere in the world. That's largely thanks to a decision by science agencies, a decade ago, to put online their satellite data and make it available for free. "For hundreds of years, NOAA (the U.S. National Oceanic and Atmospheric Administration) has been collecting that data. But when it was made open and available, that's when the apps started appearing," said Jaime Adams, an international affairs adviser for the U.S. Department of Agriculture. Now science, computer and agricultural experts hope to achieve something similar for farming and food data. 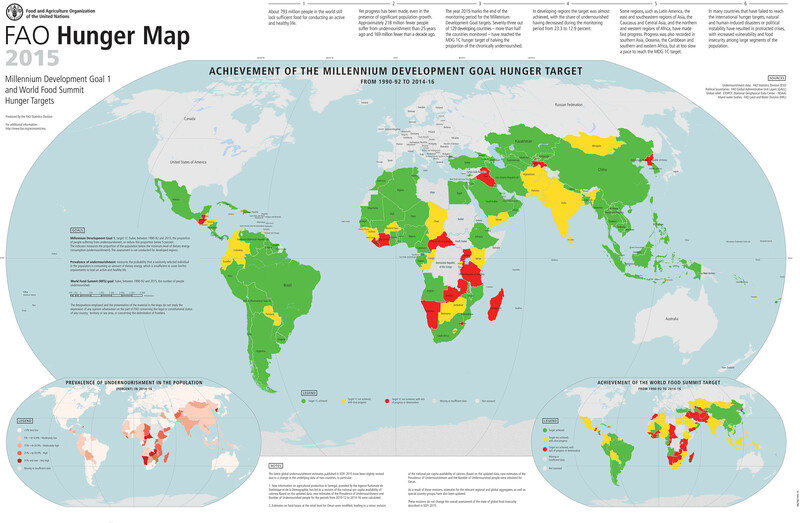 "We believe the solution to end world hunger lies in the unavailable data," said Adams. Work is underway to find and use that information. Global Open Data for Agriculture and Nutrition ( GODAN ), a consortium of 340 organisations from international farming research groups to universities and agribusiness giants, will meet in New York on Thursday and Friday to discuss progress on their "open data revolution to zero hunger". By making public information already being gathered from satellites, fields and villages, GODAN aims to spur innovation - from cheaper crop insurance to farm weather apps - to feed more of the estimated 800 million people who go hungry each day. "I consider a lot of the actions we're taking band-aids," Adams said. "For a comprehensive solution that we can look at long term, we need to put a lot of information together." Cutting hunger and growing more food is a huge challenge as climate change makes weather more erratic around the world, and as the global population pushes from 7.4 billion people today toward an estimated 9 billion by 2050. Data-based innovation could help in the form of cheaper and more accessible insurance for small-scale farmers, phone apps bringing real-time weather and market data to farmers in language they understand, or online land records that help women lay formal claim to the land they farm, Adams said. But opening up the world's agricultural statistics is no easy task. Satellite data takes huge amounts of storage space. And getting information from reports into a searchable online format is rarely a priority for those that produce it, she said. In some countries, data on groundwater levels or land fertility is considered a matter of national security, to be kept secret. Other countries don't have enough financial resources or trained people to put information online. Kat Townsend, who works with Code for Africa , a network of tech workers across the continent, recently came across university computer science students in Sierra Leone who hadn't even touched a computer until their third year. The main barrier to opening agricultural data "is not a technology issue, by any stretch" but more basic problems such as a lack of trained staff, she said. Villages often have "incredible amounts of data" on things from land ownership to harvest records, but no processes for sharing it at regional or national levels, or putting it online, Townsend said. Then there is the thorny issue of trying to make good use of the data that does become available. Countries and regions often have different names for crops - for example, corn in the United States is maize in South Africa. And information is put on the internet in a huge variety of languages and formats, ranging from household surveys to satellite photos. Still, progress is being made, backers of the effort say. In Africa, universities in Kenya, Uganda and Senegal are all working to open their research data, Townsend said. In many sub-Saharan African countries "it's a lot easier and more palatable" to open up agricultural data than other kinds. There is greater motivation because 70 percent of employment and the economy is connected to agriculture in some way, she said. The U.S. Agency for International Development (USAID) and the U.N. Food and Agriculture Organization also announced last week a $15 million programme to help developing countries in Africa, Asia and Latin America improve their capacity to track agricultural data. International agribusiness giants such as Syngenta, a member of the open data coalition, also are making public some of their research. In Syngenta's case, that includes data on virus resistance and the efficiency of crops in different climates in 41 countries, among other things. Juan Gonzalez Valero, the company's head of public policy and sustainability, said Syngenta believes making the data public "will allow people to make their own assessments" of the progress of its work, and will be "of value to farmers". U.S. official Adams said governments and other funders are increasingly requiring institutions that win research grants to make their findings available free online. But Code for Africa's Townsend said turning all the agricultural data coming online into genuinely useful solutions to boost harvests and cut hunger will require not just data-crunching but direct contact between tech experts and farmers. "You can have all the NASA data sets open, but if people who are really trying to tackle the issues aren't in the country, working hand-in-hand with farmers, then the analysis done and the insights that go out will be steps removed from the problems people are facing," she said.